Sexual dimorphism is a physical difference between males and females of a species. Reverse sexual dimorphism, when females are larger than males, has been observed across multiple owl species. The degree of size dimorphism varies across multiple populations and species, and is measured through various traits, such as wing span and body mass. Overall, female owls tend to be slightly larger than males. The exact explanation for this development in owls is unknown. However, several theories explain the development of sexual dimorphism in owls. One theory suggests that selection has led males to be smaller because it allows them to be efficient foragers. The ability to obtain more food is advantageous during breeding season. In some species, female owls stay at their nest with their eggs while it is the responsibility of the male to bring back food to the nest. However, if food is scarce, the male first feeds himself before feeding the female. Small birds, which are agile, are an important source of food for owls. Male burrowing owls have been observed to have longer wing chords than females, despite being smaller than females. Furthermore, owls have been observed to be roughly the same size as their prey. This has also been observed in other predatory birds,  which suggests that owls with smaller bodies and long wing chords have been selected for because of the increased agility and speed that allows them to catch their prey. Most owls share an innate ability to fly almost silently and also more slowly in comparison to other birds of prey. Most owls live a mainly nocturnal lifestyle and being able to fly without making any noise gives them a strong advantage over their prey that are listening for the slightest sound in the night. A silent, slow flight is not as necessary for diurnal and crepuscular owls given that prey can usually see an owl approaching. While the morphological and biological mechanisms of this silent flight are more or less unknown, the structure of the feather has been heavily studied and accredited to a large portion of why they have this ability. 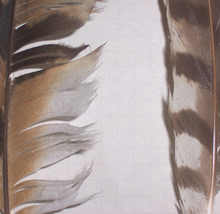 Owls’ feathers are generally larger than the average birds’ feathers, have fewer radiates, longer pennulum, and achieve smooth edges with different rachis structures. Serrated edges along the owl's remiges bring the flapping of the wing down to a nearly silent mechanism. The serrations are more likely reducing aerodynamic disturbances, rather than simply reducing noise. The surface of the flight feathers is covered with a velvety structure that absorbs the sound of the wing moving. 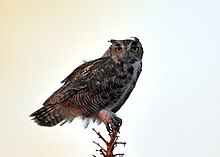 These unique structures reduce noise frequencies above 2 kHz,  making the sound level emitted drop below the typical hearing spectrum of the owl's usual prey   and also within the owl's own best hearing range. 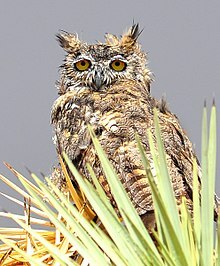 [ citation needed] This optimizes the owl's ability to silently fly to capture prey without the prey hearing the owl first as it flies in. 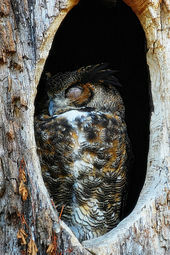 It also allows the owl to monitor the sound output from its flight pattern. While the auditory and visual capabilities of the owl allow it to locate and pursue its prey, the talons and beak of the owl do the final work. The owl kills its prey using these talons to crush the skull and knead the body. The crushing power of an owl's talons varies according to prey size and type, and by the size of the owl. 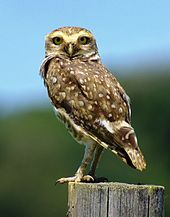 The burrowing owl (Athene cunicularia), a small, partly insectivorous owl, has a release force of only 5 N. The larger barn owl (Tyto alba) needs a force of 30 N to release its prey, and one of the largest owls, the great horned owl (Bubo virginianus) needs a force over 130 N to release prey in its talons. An owl's talons, like those of most birds of prey, can seem massive in comparison to the body size outside of flight. The masked owl[ which?] has some of the proportionally longest talons of any bird of prey; they appear enormous in comparison to the body when fully extended to grasp prey. An owl's claws are sharp and curved. 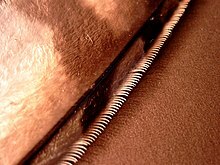 The family Tytonidae has inner and central toes of about equal length, while the family Strigidae has an inner toe that is distinctly shorter than the central one. These different morphologies allow efficiency in capturing prey specific to the different environments they inhabit. The systematic placement of owls is disputed. 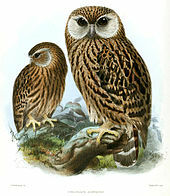 For example, the Sibley–Ahlquist taxonomy of birds finds that, based on DNA-DNA hybridization, owls are more closely related to the nightjars and their allies ( Caprimulgiformes) than to the diurnal predators in the order Falconiformes; consequently, the Caprimulgiformes are placed in the Strigiformes, and the owls in general become a family, the Strigidae. A recent study indicates that the drastic rearrangement of the genome of the accipitrids may have obscured any close relationship of theirs with groups such as the owls. In any case, the relationships of the Caprimulgiformes, the owls, the falcons, and the accipitrid raptors are not resolved to satisfaction; currently, a trend to consider each group (with the possible exception of the accipitrids) as a distinct order is increasing. During the Paleogene, the Strigiformes radiated into ecological niches now mostly filled by other groups of birds. 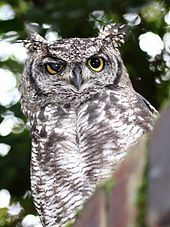 [ clarification needed] The owls as known today, though, evolved their characteristic morphology and adaptations during that time, too. By the early Neogene, the other lineages had been displaced by other bird orders, leaving only barn-owls and typical owls. The latter at that time were usually a fairly generic type of (probably earless) owls similar to today's North American spotted owl or the European tawny owl; the diversity in size and ecology found in typical owls today developed only subsequently. Although humans and owls frequently live together in harmony, there have been incidents when owls have attacked humans. For example, in January 2013, a man from Inverness, Scotland suffered heavy bleeding and went into shock after being attacked by an owl, which was likely a 50-cm tall eagle owl. The photographer Eric Hosking lost his left eye after attempting to photograph a tawny owl, which inspired the title of his 1970 autobiography, An Eye for a Bird. ^ "International Science & Engineering Visualization Challenge: Posters & Graphics". Science. 339 (6119): 514–515. 1 February 2013. doi: 10.1126/science.339.6119.514. ^ Galeotti, Paolo; Diego Rubolini (November 2007). "Head ornaments in owls: what are their functions?". Journal of Avian Biology. 38 (6): 731–736. doi: 10.1111/j.0908-8857.2007.04143.x. ^ a b c Lundberg, Arne (May 1986). "Adaptive advantages of reversed sexual size dimorphism in European owls". Ornis Scandinavica. 17 (2): 133–140. doi: 10.2307/3676862. JSTOR 3676862. ^ a b Krüger, Oliver (September 2005). "The evolution of reversed sexual size dimorphism in hawks, falcons and owls: a comparative study" (PDF). Evolutionary Ecology. 19 (5): 467–486. doi: 10.1007/s10682-005-0293-9. ^ a b c d Mueller, H.C. (1986). "The evolution of reversed sexual dimorphism in owls: an empirical analysis of possible selective factors" (PDF). The Wilson Bulletin. 19 (5): 467. doi: 10.1007/s10682-005-0293-9. ^ a b Bachmann T.; Klän S.; Baughmgartner W.; Klaas M.; Schröder W. & Wagner H. (2007). "Morphometric characterisation of wing feathers of the barn owl Tyto alba pratincola and the pigeon Columba livia". Frontiers in Zoology. 4: 23. doi: 10.1186/1742-9994-4-23. PMC 2211483. PMID 18031576. ^ Hughes A. (1979). "A schematic eye for the rat". Vision Res. 19 (5): 569–588. doi: 10.1016/0042-6989(79)90143-3. PMID 483586. ^ a b c Martin G.R. (1982). "An owl's eye: schematic optics and visual performance in Strix aluco L". J Comp Physiol. 145 (3): 341–349. doi: 10.1007/BF00619338. ^ Norberg, R.A. (31 August 1977). "Occurrence and independent evolution of bilateral ear asymmetry in owls and implications on owl taxonomy". Philosophical Transactions of the Royal Society of London. Series B, Biological Sciences. 280 (973): 375–408. doi: 10.1098/rstb.1977.0116. ^ a b Marti, C. D. (1974). "Feeding Ecology of Four Sympatric Owls" (PDF). The Condor. 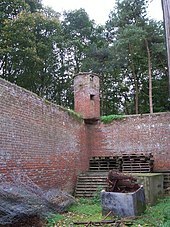 76 (1): 45–61. doi: 10.2307/1365983. ^ Einoder, Luke D. & Alastair M. M. Richardson (2007). "Aspects of the Hindlimb Morphology of Some Australian Birds of Prey: A Comparative and Quantitative Study". The Auk. 124 (3): 773–788. doi: 10.1642/0004-8038(2007)124[773:AOTHMO]2.0.CO;2. ^ Martin, Dennis J. (1973). "Selected Aspects of Burrowing Owl Ecology and Behavior". The Condor. 75 (4): 446–456. doi: 10.2307/1366565. JSTOR 1366565. ^ Alvarenga, Herculano M. F. & Höfling, Elizabeth (2003). "Systematic revision of the Phorusrhacidae (Aves: Ralliformes)". Papéis Avulsos de Zoologia. 43 (4): 55–91. doi: 10.1590/S0031-10492003000400001. ^ Peters, Dieter Stefan (January 2007). "The fossil family Ameghinornithidae (Mourer-Chauviré 1981): a short synopsis" (PDF). Journal of Ornithology. 148 (1): 25–28. doi: 10.1007/s10336-006-0095-z. ^ "Native American Indian Owl Legends, Meaning and Symbolism from the Myths of Many Tribes". Native-languages.org. 25 July 2008. Retrieved 2015-10-25. 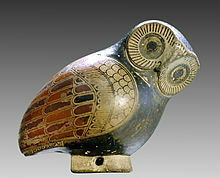 ^ a b c d "Owls in Lore and Culture". The Owl Pages. 31 October 2012. p. 3. Retrieved 2015-10-25.